Even the best retirement plans can be foiled by threats no one saw coming. From adult children to aging parents, would-be retirees face a variety of challenges that could leave them with less than they need for a comfortable retirement. Here are the five biggest threats facing your retirement plan—and tips on how to avoid them. Boomerang children. A recent study found that Boomers who support adult children are more likely to work longer. Just 21 percent were fully retired, compared to 52 percent of Boomer households that weren’t supporting grown children. They’re also 25 percent more likely to have heightened financial anxiety than their peers and to be more concerned about saving enough for retirement. Solution: Encourage financial self-sufficiency among adult children. Instead of letting adult kids move back home, parents can pay to have their children meet with a financial planner and establish a budget. Caring for elderly parents. According to one study, one quarter of adults are helping their parents with chores and personal care, and it can take a financial toll. The study found that people 50 and older who care for their parents lost an average of $303,880 in pay, Social Security, and pension benefits. Solution: Parents can often take advantage of benefits that reduce the financial burden of caregiving. Check out the National Council on Aging’s Benefits Check Up site to find out. The uninsured death of a spouse. The death of a primary wage earner can set retirement savings plans back significantly, especially late in age. According to a LIMRA report, nearly half of Americans say they would feel a financial impact within six months of a death. Solution: Purchasing term life insurance can ensure coverage during those crucial working years. For example, a 45 year old who buys a 20-year policy will be covered until retirement. A medical crisis. Hefty medical bills could force some to dip into their retirement accounts, while a major injury or chronic illness could prevent a wage earner from working for several years—or even forever. 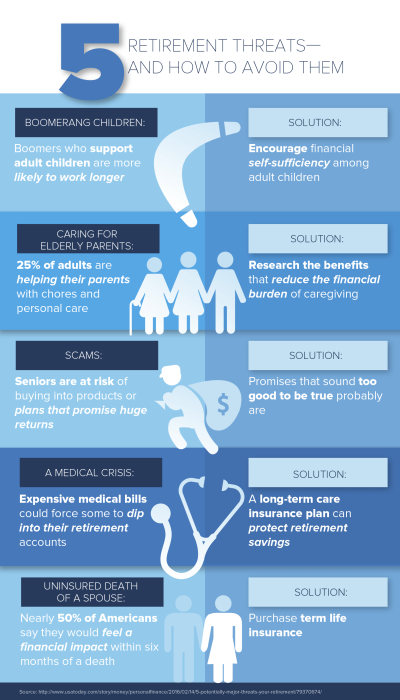 Solution: A long-term care insurance plan can protect retirement savings by providing coverage for lengthy medical care. Scams. Those anxious about a retirement fund shortfall are often susceptible to scammers. Seniors, especially, are at risk of buying into products or plans that promise huge returns, but never deliver. Solution: Always be wary of any scheme that promises investment returns of 12 percent or more, FINRA says. Watch out, too, for any promises that sound too good to be true.